Another day, another de-make, this time it's Continuity on Flash/iOS that has become Ridiculous Reality for the Atari XL as part of the 2012 ABBUC software contest. Before starting this review proper I should first point out that growing up I was never an Atari boy. In fact my entire experience with Atari's is limited to extensive use of an ST, which I loved, and limited use of a 2600 in the 1990s, by which time even my love of retro gaming couldn't convince me to spend much time on Centipede when I still had my Megadrive and C64 kicking along with a rapidly ageing PC. Therefore, from a review writing perspective my lack of experience with the hardware may be viewed as both a negative and a positive for the developers of the game. On the one hand, I might not appreciate what has been involved in creating it due to a lack of knowledge of what the machine is capable of, but on the other hand, this means that I have no choice but to view the game on its own merits. Whether this review will therefore create howls of indignation or murmurs of appreciation we shall see. Anyone who grew up in the 80s will no doubt remember The Goonies as the best film ever. Okay, maybe it isn't the absolute best film ever, but back then, as an eight-year-old with a love of adventure stories, I just couldn't imagine anything better. Hell, it's full of pirate ships, sunken treasure, bank robbers and lots and lots of slapstick violence. And that's not even to mention One-Eyed Willy, Chunk's 'Truffle Shuffle,' Corey Feldman as 'Mouth,' and that massive ugly bloke with the waggly ears. I have slipped into this reverie on times past as the Fratellis - the nasty criminal gang led by Anne Ramsay's Mama - play a significant role in the latest offering from the Mojon Twins. This is the second game to feature our heroine Maritrini after the exceedingly polished original came out early in 2012. You might recall that Maritrini was not, in fact, a monster slayer, but an actress who stars in the show... Maritrini, Monster Slayer. Ironically, she did indeed have to take up monster slaying - a huge amount of monster slaying - in the first game, as she attempted to rescue her former boss's daughter from a crazed geneticist. 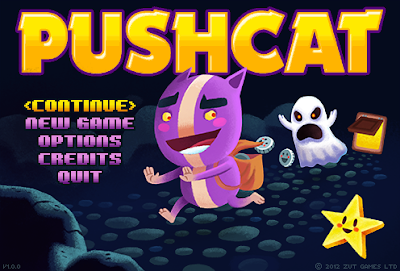 Zut Games' debut release Pushcat ticks all the boxes for a flash game, or a twitch-play, casual game on a smartphone or handheld. It's adorable, addictive, simple and if you jammed it down onto a tiny phone screen it would still look decent. It would do all right. 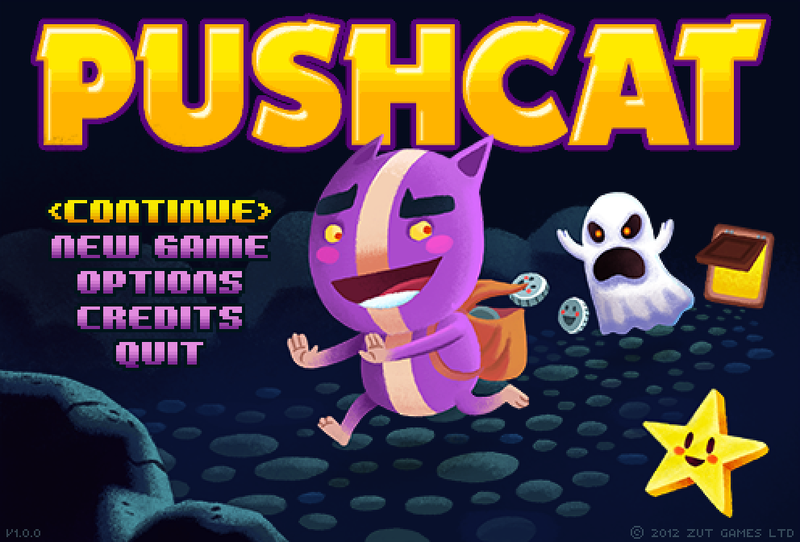 But conversely, Pushcat isn't a tablet, or smartphone, or flash game. It's a PC (and Mac) game, and it's the choice of format which pushes it (with a name like Pushcat I'm going to keep on making terrible puns by accident and I apologise for nothing) into the realms of brilliance. There's a feeling of rightness when sitting down in front of a proper screen to play a lovely, well crafted puzzle game like this, like returning to an age where bright and chirpy puzzle games like this would sell in big boxes on the Amiga for the era's equivalent of AAA prices. It is no picnic living, as many of us poor unfortunates do, in David Cameron's Britain. If it isn't riots on the streets, funding cuts and financial crises, well, they're trying to sell off our forests, take away child benefit, or make us participate in something they call the 'big society.' The problem is, no one knows what it is. Even the humble ash tree is not safe, as the Government has resisted taking simple measures to protect it for the past three years. It may be horrid, folks, but it could be worse, and D.C. is a purring tabby in comparison with H.D.M. - His Dark Majesty. Let me give you a flavour of his work. We are told, in His Dark Majesty's excellent but rather morose introduction, that the Dark Army 'descended on the land' one 'disastrous decade' ago. It brought 'chaos and pain' making 'simple worries only a memory'. Hmm, so far, so much like our Dave. 'An eternity of dread became a certainty for high-born and peasant alike.' Well, I think we can all see where the two approaches are starting to diverge!